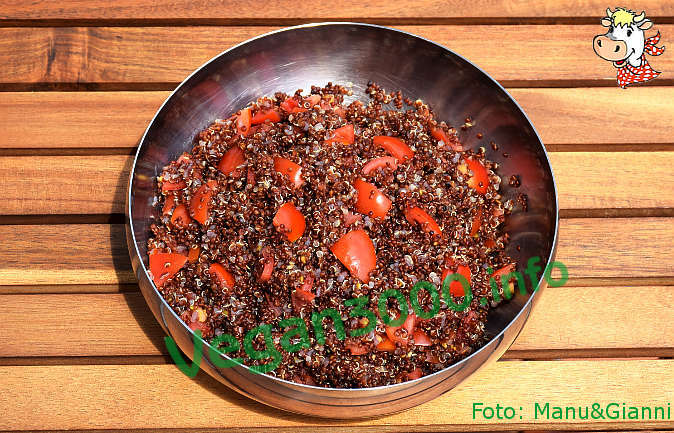 A simple, tasty, quick to peparare preparation and filling, with all the properties and benefits of quinoa ... and tomatoes! 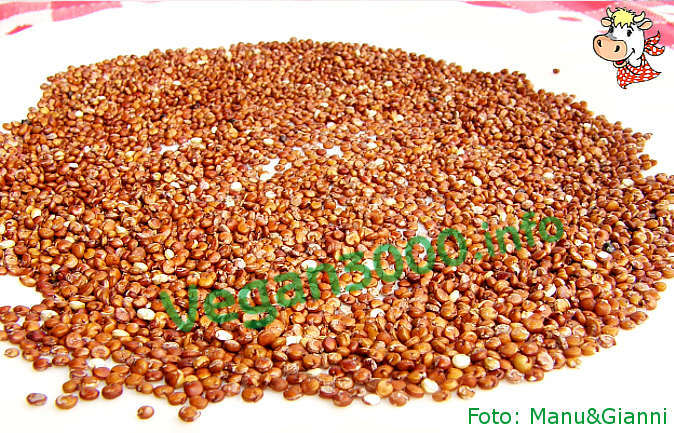 The red variety of quinoa has a slightly nutty aftertaste, delicate and pleasant, so the ideal is to accompany with ingredients or other courses that do not dominate the taste pleasant and well balanced. For this preparation with the quinoa I used delicious cherry tomatoes I had at home and I topped off with a drizzle of extra virgin olive oil cold pressed organic quality. As a final touch I merged even very little spring onion chopped fine, with an aim to enhance slightly the different flavors but be careful not to cover them; If you don't like onions you can do without and which results will be a bit gentler but no less tasty! Rinse the quinoa under running water using a fine mesh strainer, then let it toast briefly in a thick-bottomed pan with a thin layer of oil, stirring continuously: this operation will also serve to bring out the most flavor "hazelnut" of this pseudo-corn. After a few minutes, add twice the volume of water than the quinoa (approximately 550 ml) and season with salt, then bring to the boil and simmer on low heat for 25-30 minutes, until the quinoa grains you will be wide open and the water has been completely absorbed (taste if it is thoroughly cooked before putting out the fire). To add the tomatoes chopped flame extinguished and the finely sliced onion, then finish with a drizzle of extra virgin olive oil of excellent quality, mix and serve: warm and cold as salad is good.